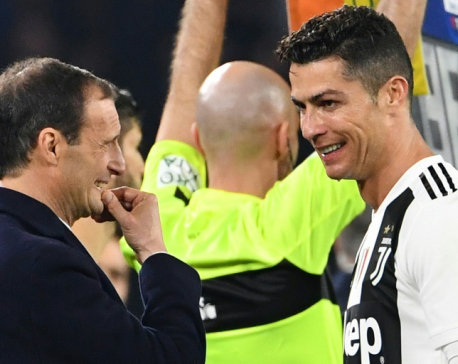 Cristiano Ronaldo is committed to Juventus next season despite his bitter disappointment at the Italian giants Champions League flop, coach Massimiliano Allegri revealed on Friday. 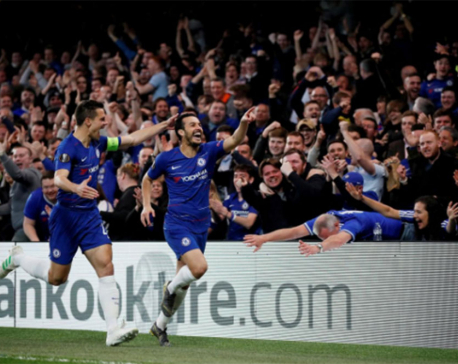 LONDON, April 19: Chelsea reached the Europa League semi-finals by beating Slavia Prague 4-3 in a roller-coaster game on Thursday, helped by a Pedro brace in a first-half onslaught before withstanding a comeback bid by the Czechs after the break. 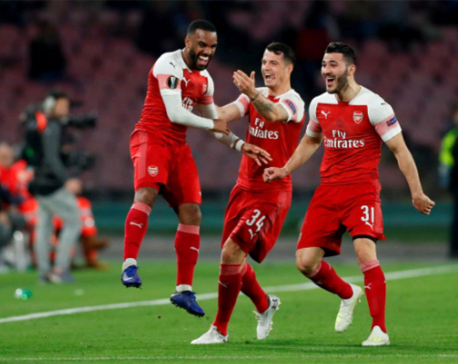 NAPLES, April 19: A magnificent Alexandre Lacazette free kick sent Arsenal into the Europa League semi-finals with a comfortable 1-0 win away to a toothless Napoli on Thursday, ending Serie A’s interest in European competition this season. 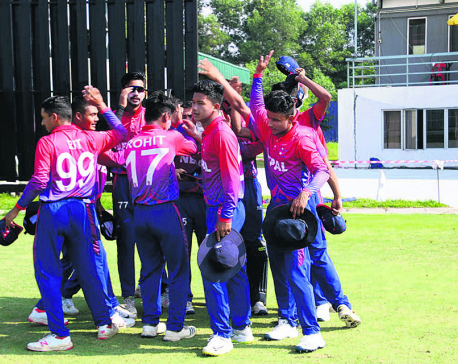 KATHMANDU, April 19: With the completion of all the five matches of the ICC Asia Under-19 World Cup Qualifier on Thursday, Nepal failed to qualify for the ICC U-19 Cricket World Cup to be held in South Africa in 2020 despite that Nepal won four of the five matches with good performance throughout the league. 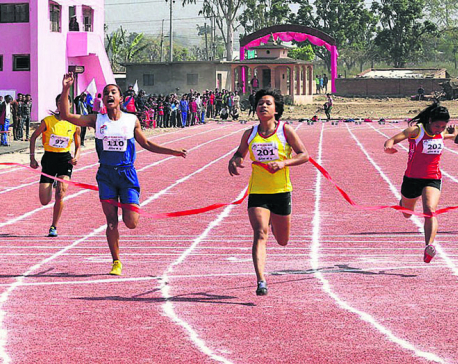 DANG, April 19: The departmental team Nepal Police Club’s Chandrakala Lamgade has improved her own record in women’s shot put as she won the gold medal. She improved her record by throwing the iron ball to 12.04 meters to win the gold. Her previous record was 11.46 centimeters at the National Sports Council (NSC) Championship. KATHMANDU, April 19: Departmental team Tribhuvan Army Club doubled its win tally in the ongoing Eighth National Games defeating Karnali Province by six wickets in the second match of the Group B at Kohalpur Cricket Ground, Banke on Thursday. KAPILVASTU/DANG, April 19: The departmental teams Tribhuvan Army Club and Armed Police Force (APF) Club have continued their winning run by registering big margin win over Gandaki and Karnali Provinces respectively in women’s football on Thursday. 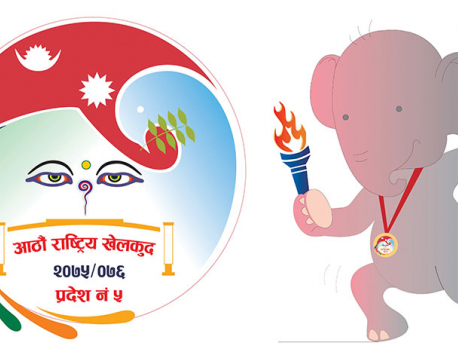 BANKE, April 19: The Eighth National Games has officially kicked off at the Nepalgunj Stadium, Banke. 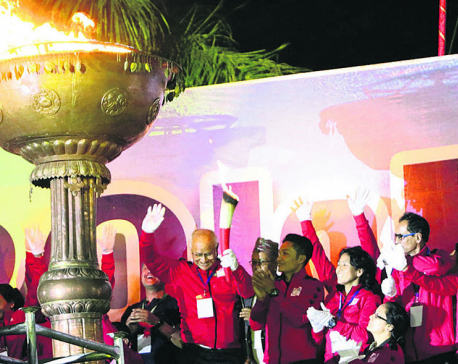 President Bidya Devi Bhandari inaugurated the Games amid huge enthusiasm and fanfare on Thursday. KATHMANDU, April 18: The United Arab Emirates win over Oman has ended Nepal’s hopes of qualifying for the ICC-U 19 World Cup. RANJHA, April 18: Well-equipped sports infrastructures have been developed in Banke at the investment of Rs 480 million in view of the 8th National Games.